This was taken moments after the Ironic picture. She's such a little sweetheart. So, I took a day off...and it was magical. Well, sort of. The last 36 hours have really been interesting. Several things have happened that I didn't expect. But I'll get to those in a moment. It did snow and blow last evening and night. In many ways, I was happy about that. It'd been a while since we got a reasonable snowstorm, so I was happy. It was also just plain snow. No other icky stuff, so that also makes me happy. Jill had to work in Wheaton today, and to make a long story short, she ended up staying with us last night (since we're about halfway between her house and Wheaton, which is around a one-hour drive for her). Due to the impending snowstorm, it was simply easier to stay with us for a night. And it was a good time, too, however unexpected. I also reorganized the top shelves in the office this afternoon. Put some books away in boxes to be stored in the attic, threw some things out, and straightened up things. Looks considerably better (and less cluttered) than before. This was partially a side effect of clearing the floor, but quite unexpected in how far it managed to go. And probably most unexpected of all -- I managed to shovel out (by hand) our entire driveway and turn-around area. We probably had somewhere between two and three inches of snow (it's tough to tell due to drifting), but it was all light and powdery. Well, 85 feet of 15 foot wide driveway and a car-and-a-half sized turn-around area adjacent to the driveway later (it took about an hour), I had really accomplished something. I'm sure I'll pay for it tomorrow. And Saturday. And Sunday. :) I can feel it in my lower back now this evening, but I think a good night's sleep should keep things from getting too messed up. So I can hope, anyway. So I had a good and productive day at home today. It was nice to actually get some things done that I'd not been able to due to scheduling issues and the like. To wrap up the evening (well, short of my sitting here and writing these posts tonight), Beth and I sat down and watched Crash, which I just recently got on DVD. It really is quite an amazing movie. There is a lot of subtle (and not subtle) social commentary in that film, and I liken it to being a racially-charged version of Magnolia in a way. If you've not seen either of those movies, I would highly recommend them. 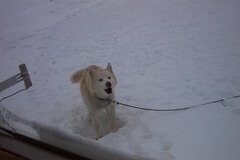 Koshka howls at me to get out there from her latest snow hole adjacent to the house. Back in November I rambled on about a phrase I really hate: 'Grow' whatever. I won't bore about the details of my distaste for that phrase (read the November post for that), but I finally figured it out. I now know why they can't/don't say 'create jobs' instead of the all-too-popular 'grow jobs.' And it's really quite simple. You see, the creationists would prefer to say 'create jobs,' while the evolutionists would rather say 'grow jobs.' It's really, really that simple. And due to the separation of church and state (unless you're living in Kansas**), it is very much uncouth, arguably politically incorrect to take the creationist stand. Here endeth the dripping sarcasm. **There's an interesting episode of 'Family Guy' (one of my more favorite social commentary programs) in which the evolution versus creation argument is played out with a large stab at the state of Kansas where Jeannie ('I Dream Of Jeannie') magically winks everything into being. Okay, so maybe I didn't win, but I did have this photo (see the original for clarity) selected as the KMRS/KKOK Photo of the Day for February 12, 2008. So I again apologize for another incredible absence from posting. Even though I didn't do One-Act this year, my early February has just been jam-packed with things happening it seems. Speaking of One-Act, it was an interesting season this year. Beth and I went to watch the Section 3[A] One-Act competition in Redwood Falls on February 2. It never ceases to amaze me the incredible talent that's on display every February in Southwest Minnesota. The section competition is almost always more interesting to watch than the Sub-Section competition, mostly due to the amount of fine-tuning that's been done to each production (in contrast to just a week earlier at the previous contest). For $12, Beth and I watched eight really amazing productions. I'd highly recommend catching theatre in this sort of format. One thing we didn't do this year was travel to watch the State Festival. It's the first time I've missed it in the last seven years. In a way it was nice -- I didn't have to arrange for the trip to take place (even if it were only for Beth and I) -- but I also missed not seeing the incredible theatre during the two-day event. We'll see -- maybe next year. Beth and I were considering going for one day, but then the school whose performance we would've tried to see didn't make it to the festival, so the ultimate desire wasn't really there to do all that driving (six hours round trip) just for one day. So we skipped it this year. Other than that, I've been keeping busy. The unfortunate thing is that I can't really say how. Not that I'm keeping anything a secret -- it just seems as though I've always been busy as of late. But, I've taken quite a few pictures, hung around with Beth and Kirstin, and doing the daily grind as usual. Those three activities take up most of the weekdays. I think the problem I've had lately is in my weekend time. We've been gone off and on each weekend (namely on Saturdays, which are my Power Days for getting random things done) for several weeks now, so the household pile (read: massive pile of things in the office here at home) hasn't been tackled. This is a project for later this week and this weekend. I did manage to get the better part of my desk cleared off last week, which was very much a welcome change. But, I need to do some serious things here now. Filing, organizing, and throwing. At this point in time, I'm considering taking a day off later this week to tackle the project. It will save me vast amounts of time and effort (as opposed to scanning hundreds of images). That is worth a small fee, since I'd be looking at weeks of scanning in my free time. So that's cool. I'm excited, since it means I can expand my Flickr collections even further! And speaking of Flickr, I uploaded image number 4,000 tonight. Seeing as how my official Flickr birthday is on February 24 (the day I uploaded my first image), I think that's fairly impressive. :) One might actually call photography a 'hobby' of mine! Which leads me to the next mini-topic, the subject of this post's image. 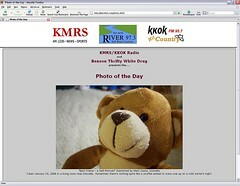 My image was chosen as the KMRS/KKOK Photo of the Day today! Go me! I don't win anything for it (short of the fame), but I am entered into the monthly drawing for a free photo frame. Still, I had to do a screenshot of it!